The GWR route from London to Bristol passed 2.5 miles from Wantage and in 1873 a meeting was held to promote a tramway from Wantage Road Station to Wantage. The Tramway opened for goods and passengers in October 1875. It flourished until after the First World War but traffic then declined and the passenger service was withdrawn in 1925. Goods traffic continued until the final closure in December 1945. My father was an apprentice compositor with Clegg and Son who printed the tram tickets. 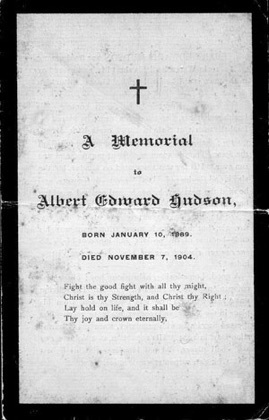 A distressing accident occurred at Grove on Saturday evening, involving the life of a lad named Albert Edward Hudson, a native of Wantage. It appears that a party of footballers returned from Swindon by the last up train, and completed the journey to Wantage by the tram. There were two cars, and Hudson boarded the first one, in which the only other passengers were a clergyman and a lady. When the tram had passed the lodge leading to Lockinge, Hudson was missed, and simultaneously those in the second car felt a jerk as if the vehicle was passing over some obstacle on the line. A G.W.R. signalman who was on the rear footboard, noticed a dark object on the rails, and the conductor, who at the time of the accident was inside the car taking fares, at once blew his whistle and brought the cars to a standstill. On going back the body of the unfortunate lad was found, with the right leg severely injured, and he was conveyed to the Cottage Hospital. On Sunday an operation was performed and the leg removed, but it was of no avail, and death ensued on Monday afternoon. The inquest was held in the Council Chamber, on Tuesday afternoon, by Mr. Ll. Jotcham, coroner for the district. Mr. E. Ormond (secretary of the Wantage Tramway Company), Mr. J. W. Kent (one of the directors), and Mr. J. Noble (manager) were present during the proceedings. The Coroner, in his opening remarks to the jury, said they would all agree with him that it was a most unfortunate occurrence, and the father and mother, and the other relatives had their deepest sympathy. He saw the deceased on the Monday morning and had a conversation with him. The Tramway Company had placed a car at the disposal of the jury so that they could see the spot where the accident had occurred. He did not know whether it would be necessary for them to do that, but if it was any satisfaction to them, or if it would help them in any way, they would proceed to view the body and then go by tram to the spot where the occurrence happened. Mr. Gauntlett could not see what benefit it would be. There was no sharp curve in the way, and it was only a few yards from the station. On being put to the vote, eleven of the jury were in favour of visiting the spot. On their return, Emma Hudson, sister of the deceased, identified the body as that of Albert Edward Hudson, who was 15 years of age, and a carpenter, apprenticed at Mr. Wheeler's. He lived at home, was very tall for his age, being six feet high, and not particularly strong. He was a member of a football club, and on Saturday last went to Swindon to play in a match. When deceased left home he was apparently in his usual health, though after a match he always looked very pale and exhausted. He suffered from giddiness. Witness had had no conversation with the deceased since the accident, he being unconscious when she saw him on Monday. Frederick Jones, a member of the Wantage Athletic Football Club, and one of the players who went to Swindon on Saturday, said he knew deceased, who went with the football team to Swindon. They left Wantage at 1.25 p.m., and the match commenced at about four o'clock and finished about five o'clock. It was not a hard match, Wantage having their own way all the time, and deceased played at back. 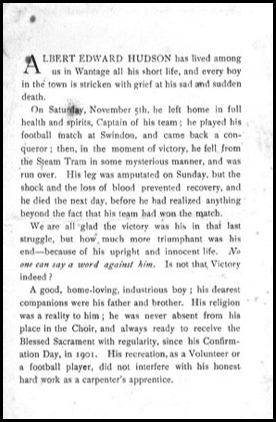 After the game deceased met his brother and returned with the rest of the team by the 7.35 p.m. train from Swindon. He appeared all right then and also when they arrived at Wantage-road just after eight. Most of the players returned to Wantage by the tram, deceased being in the first car, There were no other footballers on the car with him. Deceased stood outside, though there was ample room inside. Witness was standing on the front platform of the other car, and deceased had been talking to the others from his car. The Coroner: Did you see him fall? As a matter of fact, you did not know an accident had happened until the car jumped? -- Then we did not know it was an accident until we saw him on the ground. When you felt the jerk and found Hudson was missing, what did you do? -- The conductor came out; he was in the car collecting the fares. Did you see Hudson sitting on the rail outside? -- No, Sir. Have you ever seen him do that? -- No, Sir. Though it is a very frequent thing to see passengers sitting on the rail outside. -- Yes, I know it is. Did anyone invite him to come over to join your car? -- We asked him to come with us, and he said he was all right where he was. You did not see him attempt to get across? -- No. The Foreman: Did you ask him to come before the tram started or after? -- Before the tram started. There is a question which I must put. Were you all sober? -- Yes, Sir; we had not been in a public house at all. William Hawks, living at Challow, stated that he went to Swindon with the Athletic Club on Saturday. The tram on which they returned to Wantage left Wantage-road at about 8.15 p.m., witness being in the second car and deceased in the first. It was dark, but deceased could be seen standing on the platform. Witness was in the front of the second car, and had it been daylight he could have seen all that went on. There was room in the car for the deceased. He saw something fall from the platform of the first car, but it was too dark to distinguish what it was. The jump of the car was felt by witness, and that led him to look and see if deceased was still standing on the platform. He could not see him, so he spoke to the conductor. There was nothing unusual about the pace of the tramcars, no sudden jerks or stoppages, He could not have been jerked out of the car. There was nobody else on the platform besides him. The conductor stopped the car, and he found the deceased at about the spot the jury had visited that afternoon. He was lying down about a yard from the line, and seemed to be very much injured. Deceased told them where his bag was - in the middle of the lines - and said he had broken his leg. He was put into the car and taken to the Cottage hospital. Deceased said nothing as to the cause of the accident. Witness had never heard deceased complain of giddiness, and there was no "skylarking." A Juryman: Did he seem to fall over the rail on to the centre of the railroad? The Coroner: Could you see that? Witness: No, not exactly, but he seemed to me to fall over the rail on to the centre of the line. When found, deceased was lying face downwards. Arthur Ernest Argyle, signalman at Wantage-road station, said he was returning to Wantage by the car which leaves the station at about 8.20, and before starting he noticed deceased get on the front car. There were two passengers in the car, and witness stood on the rear platform of the second car. About 200 or 300 yards past the Lodge he felt the wheel pass over something, and on looking over the lines he noticed a dark object on the rails, and at the same time the conductor blew his whistle, stopping the train. Witness, in company with others, went back to see what had happened, and deceased was found lying parallel with the lines, about a foot or eighteen inches from them. He seemed to be severely injured, and in reply to questions as to how he fell off, he said "I don't know, go and fetch my dad." The cars were running smoothly, and in witness' opinion, deceased could not have been jerked off. The cars were not going at an unusual speed; certainly not more than ten miles an hour. William Savery, tram conductor, said he was in the car, collecting the fares, when he felt the bump. He opened the door and blew his whistle, The cars were stopped and witness gave directions for them to be backed There were only two other passengers in the car, and no luggage on the platform. Mary Pike, matron at the Cottage hospital, said the deceased was admitted about a quarter to nine on Saturday evening, suffering from a compound fracture of the right leg. He was quite sensible and not particularly exhausted. Witness asked him how the accident happened and he replied, "I was standing on the back of the car when my knees gave way." He further stated that he had felt his legs give way several times before, and that no one was to blame. Deceased made that remark several times. The wound was dressed and packed, and Mr. Emerson stated that Mr. Sankey, of Oxford, would be over first thing in the morning. On Sunday morning, Mr. Sankey arrived and decided to amputate, the operation being performed about 11.30 a.m. He died at 3.45 on Monday afternoon. Thomas George Emerson, surgeon, one of the medical officers at the hospital, said at 8.45 on Saturday evening last he saw deceased at the terminus of the tramway lying on a seat in one of the cars. He made a brief examination and ordered his removal to the hospital as quickly as possible. Witness, with his partner, Mr. Woodhouse, and Mr. Loveday, made an examination in the operating room, and owing to the fact that deceased was suffering from shock, it was decided to postpone any operation till the following day. Mr. Sankey arrived he next morning, and it was decided that amputation was necessary to save life. The leg was successfully amputated in the presence of Messrs. Sankey and Loveday, three nurses, and himself. The injury to the leg was a compound fracture, with great laceration of the soft parts. It was very possible that deceased had had a slight fainting fit when he fell - that was a very reasonable explanation. Death was due to heart failure and loss of blood. The Coroner summed up, and the jury retired to consider their verdict. After ten minutes private deliberation they returned a verdict of "accidental death." The enquiry, which lasted over three hours, then terminated. The funeral took place on Wednesday afternoon, amidst manifestations of sincere sorrow and regret, at the Wantage Cemetery. 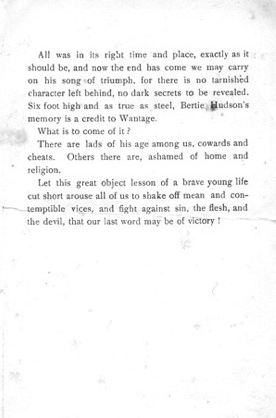 The procession left the Cottage Hospital a little before three o'clock, and in addition to the relatives and friends of the deceased who followed, between 30 and 40 of the members of the K Company of the local Volunteer Battalion attended (deceased having been a member of the Company) as well as a number of the members of the Football Club. The coffin was covered with the Union Jack, and deceased's helmet and accoutrements were placed thereon, but were covered up with a large number of most beautiful wreaths. There was an extraordinary large number of people in the Cemetery. The service was performed by the Vicar Canon the Hon. M. J. G. Ponsonby, the Revs. R. R. Thomas, M. R. Newbolt, F. H. Tupper, and T. R. Anstey. The deceased was a chorister, and the choir attended the Service, the hymns sung being " On the resurrection morning," and "Peace, perfect peace." At the conclusion of the service a firing party of 18 of the Volunteers fired volleys over the grave, and the buglers sounded the Last Post. The Volunteers were under the command of Col.-Sergt, Reynolds, the Instructor. The wreaths were most beautiful, and were sent by the following :—The relatives of the deceased ; Archdeacon and the Misses Archer Houblon; Mrs Cook, Highfield ; Mrs Ponsonby ; St. Katherine's School ; Mrs. and the Misses Gibbons ; From his comrades of the K Company ; Mother Superior and Sisters of St. Mary's Home ; From his shopmates ; The Mead class boys; From the members of the Wantage Athletic Football Club, as a token of our love and sympathy for our late Captain ; Mrs Bruton Deare, the Ham ; Mr Jotcham ; Childrey Thistle Football Club ; Fellow choir men and Mr Hill ; From the choir boys ; The Wantage Tramway Co. ; Commander and Mrs Daintree, and many others.